The ECB also reports that interest rates are rising for smaller loans and falling for larger ones. 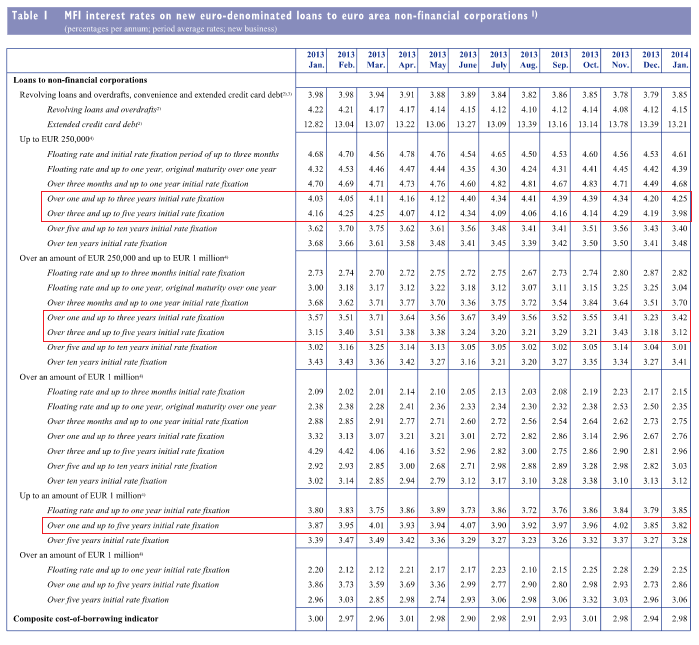 According to this, EMU average interest rates are now falling on SME loans (see circled area). But the ECB says that average interest rates on new lending to non-financial corporations are rising. How do we explain this discrepancy? I've outlined in red those that correspond to the "EMU average" line on the chart. For those loans, the average interest rate has indeed fallen, both month-on-month and year-on-year. But overall, the composite cost of borrowing is rising, not falling. There is nothing to be cheerful about yet. However, despite its limited data set, this chart is still informative - indeed fascinating. Firstly, average interest rates on this particular subset of MFI loans to German, French and Spanish SMEs are falling, but Italy seems to be heading in the opposite direction. This is probably due to its government shenanigans. It's hardly a stable political situation. Secondly, there is evident credit bifurcation. The "EMU average" SME interest rate does not exist in reality: SMEs in core countries benefit from lower interest rates, while those in periphery countries suffer much higher rates. This is also consistent with lending volume figures that show rapidly falling lending volumes in periphery countries. Basically, banks don't want to lend to SMEs in periphery countries, and if they have to, they charge high rates. Clearly, the financial crisis took its toll. Corporate defaults have been rising since 2008. In Spain's case, the sharp rise in defaults in 2008-9 is undoubtedly due to the collapse of its construction bubble. But it's hard not to draw the conclusion that deepening recession in all three countries since 2011 is increasing corporate defaults and therefore raising the risk of lending to SMEs. The ECB raised interest rates in 2011, which may have triggered a rise in corporate defaults, but when the ECB cut interest rates again the corporate default rate did not fall back, and neither did interest rates to SMEs. Evidently any banks still lending to periphery SMEs simply used the rate cuts as a means of increasing margins, rather than reducing rates to borrowers. Banks are certainly under pressure to reduce higher-risk lending and improve their capital positions. The forthcoming Asset Quality Review is the latest in a long line of attempts to cajole or coerce banks into cleaning up their balance sheets. Unfortunately SME lending, which is generally fairly high-risk, tends to be badly hit when bank regulation is being tightened. And lending to SMEs in damaged periphery countries is about the riskiest form of lending there could be. No wonder SME lending volumes in periphery countries are falling off a cliff and interest rates are much higher than in core countries. To terminate these firms in a misguided belief that capital and labour needs to be reallocated would be to kill the next generation of firms and undermine the process of creative destruction. If it is true that the combination of recession, fiscal austerity measures and tightening of bank regulation is causing a severe credit crunch for periphery SMEs, then it seems appropriate for targeted support for SME lending in periphery countries to be provided at EU level, most appropriately by the ECB. After all, both sovereign and bank reforms are being done at the behest of the European Commission with the intention of restoring sustainable growth in the long-term. Killing off the very companies that will be needed to secure that sustainable growth is folly. There is a desperate need to ease credit conditions for SMEs in periphery countries. The slight easing of interest rates on certain categories of loan for Spanish SMEs is welcome, but it is nowhere near enough. The EU must find ways of improving access to finance for SMEs in periphery countries. The future of those countries, and perhaps even of the Eurozone itself, depends on them. In view of the ballooning levels of private sector debt we’ve seen in recent decades, and to which Adair Turner amongst others has objected, I’ve got doubts about the wisdom of effecting stimulus by encouraging yet more debt. I suggest the EZ copies the US, and spends more base money into it’s economy. As there is no banking procedure by which the ECB could do it , it would have to be more like the Funding For Lending scheme. Dinero, If you’re saying base money can’t get out into the real economy, that’s a common belief with which I disagree. To illustrate…. If I sell Gilts worth £X (say as part of the QE operation) I get a cheque from the Bank of England for £X which I deposit at my commercial bank, which in turn presents the cheque to the BoE, who in turn credit the commercial bank (in the BoE’s books) with £X. I.e. the commercial bank’s reserves rise by £X. Now that dollop of dinero / money (excuse my Spanish) is very much mine to use or spend anyway I want, isn't it? Strictly speaking I don’t have direct access to base money or reserves. But the reality is that I do: it’s just that my commercial bank acts as a go-between or agent for me in “my dealings” with the BoE. But that is not base money is it. In your illustration you explicitly said " I get a cheque" so that is not base money that is checking account , personal current account money M2. Your original point was about government spending. You suggested it would stimulate the economy if the government did some spending and thus put money into peoples current accounts which they would then do some spending in turn. That's not base money that personal current account checking account money M2. M2 isn't used in the UK. There is M0 which is monetary base, and M4, which is deposits at commercial banks. Re the rest of your comment, you are still assuming that a given chunk of money has to be M0 or M4 (what you call M2). In fact a given chunk of money can be BOTH M0 and M4 at the same time. Here is a quote from Richard Lipsey’s text book which makes the same point as I made above. That £1m is both monetary base and M4 or “checking account” money. Well Ralph they are the same thing or more accurately base money follows deposit account transactions if the transacting banks choose to use crest or chaps. But the point is no one can spend base money, the government cannot "spend more base money into the economy". Whoever the group pick needs to be someone with that vital ability to genuinely lead and engage and encourage the group's staff in a way that has been sadly lacking. A version of this post appeared on Pieria in December 2013. In my post “The desert of plenty”, I described a world in which goods and services are so cheap to produce that less and less capital is required for investment , and so easy to produce that less and less labour is required to produce them. Prices therefore go into freefall and there is a glut of both capital and labour. This is deflation. There are two kinds of deflation. There is the “bad” kind, where asset prices go into a tailspin and banks and businesses fail in droves, bankrupting households and governments and resulting in massive unemployment, poverty and social collapse. America experienced this in the Great Depression and narrowly avoided it in the Great Recession. More recently, at least one European country has felt the effects of this catastrophe. For over a century now, the world has lacked a genuinely international means of payment. This is partly due to decisions made at the Bretton Woods conference in 1944, when the US dollar was adopted as the principal international settlement currency, rather than John Maynard Keynes's suggestion of an independent global currency that he called "bancor". Although the Bretton Woods gold-backed structure ended in 1971, the US dollar became ever more dominant. In 2008, the dollar's global reach enabled an American financial crisis to spread to the entire world, causing a deep recession and long-lasting malaise. Ever since, there has been a deep longing for a more stable international financial system, one which didn't depend on debt, wasn't dominated by the US and was immune to political whims. Some have called for a new Bretton Woods, or even for the return of the classical gold standard. How many countries can really claim to have full monetary sovereignty? The simplistic answer is "any country which issues its own currency, has free movement of capital and a floating exchange rate." I have seen this trotted out MANY times, particularly by non-economists of the MMT persuasion. It is, unfortunately, wrong. 6. The Government does not borrow in any currency other than its own. This appears solid. But in fact, it too is wrong.